This is a post that has been coming for a while. I don't mean to imply that this quilt has taken a while, but rather that the topic is one that many piecers should have a good look at. Longarm quilters that have quilted for a while have undoubtedly encountered a quilt that just would not lay quite right on the frame. You see, our frames are square, and they want to lay the quilt flatly, so if a quilt is not both of these things, then we're going to know it immediately. In cases with a minor problem, we can usually quilt the quilt making the piecing anomaly mostly unnoticeable. Cases where borders are just too ruffly often require some manipulation in order to quilt them. Let's backtrack for a moment... I had the tremendous pleasure of quilting this gorgeous quilt (made by Robyn P) over the last few weeks. 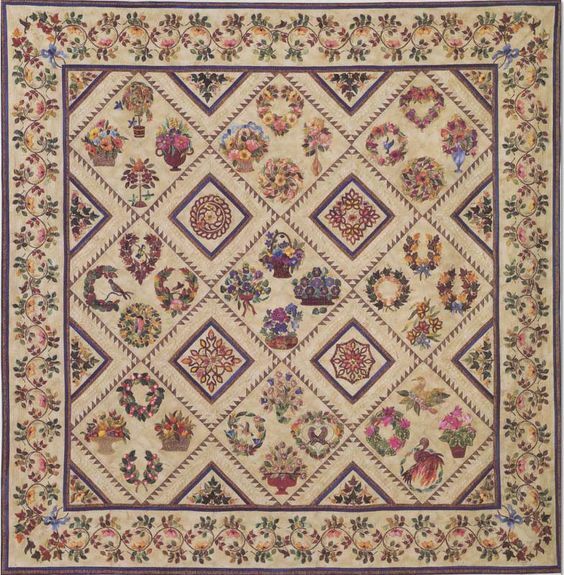 It is a pattern called Little Brown Bird by Margaret Docherty. As you can see by the photo of the right half of the quilt below (laying in my 7' hallway), this is bohemoth! It measured 110"x116"! Now, before I go into the nuances of this quilt, please know that I have Robyn's blessing to share this story. It is in no way a roast of her piecing abilities. We want others to understand what happened during the quilt's construction, and the implications these errors had on the ease of quilting. You can tell from the nature of this quilt that Robyn is unusually gifted at complicated applique. She does quilts that I personally would not dream of doing. I have already quilted her Ladies of the Sea a few years ago, and a couple of other applique quilts just earlier this year. She knows her way around needle-turn. I know that the applique will be the star of this quilt. I made one error when I assessed the quilt as I loaded it. I did not fully lay it out flat to confirm that it is fully symmetrical, and should have been a square. It is massive, and I don't have a flat space this big. I just measured, and assumed it was rectangular. That should have been the first red flag. I loaded it on my longarm, floating it down the front of the machine as I usually do. I didn't really see anything too fishy. Often if a quilt has "flutter" or "lettuce ruffles" it is obvious immediately. Half of this quilt pooled on the mat at my feet so it was not even visible. The top 12 or so inches of the quilt stitched just fine. It was not until I rounded the corners that I began to see a serious problem. Let me show you a full shot of this quilt. This was made by Jo Timko, and I just pulled it from the internet. What I want you to notice are the vertical setting triangles. I am not sure if the pattern is written poorly, or if Robyn just made them this way, BUT the triangles had the long side on the bias. If you starch the heck out of the fabric, you can get away with doing this. I have been known to if I am short of fabric or time. The step I never skip is basting that edge to hold it's intended length. Unstarched bias fabric will stretch significantly. I believe that both of those triangles were easily part of the reason that the borders were 7-8" longer than they should have been. Another way borders, especially wide borders, can be attached and "grow" is when they are just strip cut and sewn on. If you don't measure the interior of the quilt in 3 places, then cut the border to the average size, you will almost always over-do the needed length. When a border is plain fabric, it is simpler to "tweak" this on the fly if it has too much fabric. Often, I take a perfectly perpendicular tuck, baste it down, and then quilt normally. The tuck can be hand stitched down after quilting. Tucks are only needed when there is a significant excess. Frequently, steaming the border or starching it will cause it to pull in enough to lay flat. The borders on this quilt had another issue though. They are laden with an absolute TON of applique. Steam and starch would have done nothing, and there was no place to put a pleat without mangling the applique. Further, it became apparent quickly to me that the inner sashing (blue/brown) ALSO had too much fabric and was not going to lay flat either. This is the point where the quilter wants to cry. I played with options like putting tucks to see if the border layed flatter, but it really did not look good. As you can see, areas nearer to the triangles were considerably worse. The bottom border looked better than the sides, but it still needed manipulation. Had this been a solid fabric border without applique, I could have made this look fine without any magic. Clearly, though, this was going to require buckets of pixie dust. I got in touch with Robyn so we could make a plan. She needed to be in the loop at this point in the process because I couldn't foresee a plan for the quilting that was not going to muck up her gorgeous applique. Much to my relief, she offered to ship the quilt home and undertake the fix. Another plus...I really didn't want to do this myself. What I did to help her was to go down the three borders I had not already SID, and I pinched fabric in the two borders. I treated the blue/brown borders as one unit, and the applique wide border as the other. It is typical that the amount of fabric needing to be removed increases as you move further outward on the quilt. By pinching the excess, and pinning I got a good handle on how much needed to be taken out. It was more nearer to the triangles, but I hoped that taking it out as a lump amount would do the trick. I instructed Robyn to remove the borders, but to leave them attached at the corners. This would keep her from having to redo applique at the corners. There were places with less applique that were good candidates for where extra fabric could be eliminated. She had target amounts to take out of the borders, then to reattach them and "fix" any appliques that needed repair. I won't say this was a small job, but it could have been much worse. Before I removed it from the frame to ship to CA, I ditched the remainder of the middle part of the quilt - yup, all the center applique blocks. I was very reluctant to leave it just basted for her to do the repair. I have had too many bad experiences removing quilts that have insufficient quilting puckering and pleating. Other longarmers know exactly what I am talking about. About 3 weeks after I mailed it home, it showed back up at my door! Unfortunately I cannot find a picture to show how it looked, but suffice it to say, the side borders were WAY better. They layed almost flat, as they should. It was a big job dealing with totally unquilted 10" borders and a totally stabilized quilt body. I spent a goodly amount of time loading this quilt, basting the borders every 3-4" to stabilize them and ensure that they were going to be flat with the backing. We'd gone to too much trouble to fix the top only to have a backing full of tucks. No thank you. I worked my way down from the top to the bottom. Some of the SID had been removed to facilitate the fix, so that had to be restitched. When I reached the bottom border, I immediately started there, stitching around the appliques. The less I needed to roll this quilt, the better. I then worked back up, ditching. The next photo shows the fully quilted bottom border, but the details were not quilted until ALL of the SID was finished on the entire quilt. Then and only then could the fun, decorative quilting start. Most of the showier quilting was stitched in ivory Glide thread. Even though these borders don't leave too much room for developing designs, I wanted to try to do something. A little crosshatching strategically oriented to the piecing, some feathers and piano keys at the outer edge. The rest of the area is filled with an echo-style meander that is easy to snake around copious amounts of applique. Here's the left half of the quilt. 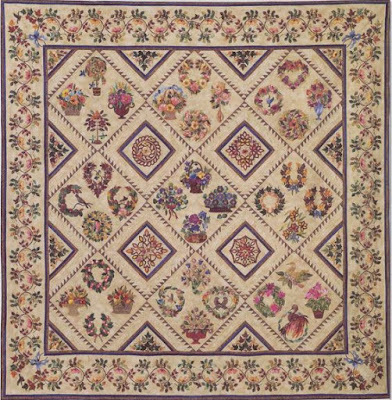 The feathers are a dominant motif, and seem perfectly chosen for such a traditional quilt. I also like them because they don't take days to stitch. Just mark the spine, stitch the spine, and quilt. The worst part is that these are such huge squares that I was constantly rolling the quilt. I know there are plenty of quilters that omit the spines. This is just one of my little pet-peeves. Spines create cleaner looking feathers. It always gives you a landmark to quilt back to...kind of like the place to anchor the feather. There are 9 of these 4-block applique sections. They are like 20" on point, so HUGE! I like to repeat fills and motifs that have been used because this promotes cohesion within the design. That is why these have a little bit of feathers, a little of the leafy fill (on corners) that is on the triangles and 4 central Hawaiian-style blocks, and more of the echo-meander. The feathered wreath at the center is the quintessential traditional motic, and IMHO, perfect for this place. These applique blocks are so wildly gorgeous. I cannot fathom how long each took, though Robyn said she worked on this for 2 years. It is going on her bed. Because it is applique, I used a wool batting. Had this been smaller, more like a wall-hanging, I might have double batted it. This would have really popped the motifs and applique. For a bed, though, and in southern CA it can really get heavy and hot unless it is micro-quilted more than I did. Despite not being overly micro-quilted, I still used about 3-1/2 miles of thread on this puppy! THAT is a LOT of thread. I did get to a point where I wondered if I might run out of my top thread. There are a few details quilted in a color other than ivory, but not much shows on the pictures w/o lots of zooming. I love these 4 Hawaiian-type applique blocks. Robyn described them as Scherenschnitte - a form of German cut paper art. Because they each had a ridiculous amount of stop and starting just to ditch them, I doubt you'll see this on a quilt of mine anytime soon...LOL! There are so many silly and awesome details in the applique and embroidery. Here are the strawberries...Just look at the little gold seeds and the green thingys on the leaves. This type of detail is everywhere on the quilt. And these little ribbon flowers...They are all over the borders, as well as the blocks. They have embroidery and beading details. I'm pretty impressed that I only broke 3 or 4 of her beads too!...There are hundreds on the quilt. FYI...piecers whenever possible add beading and crystals after I give you back the finished quilt. They are impossible to do on this quilt and I knew that, so I had to be ultra careful. I'll leave you all with a few pics of the back - it is all texture. Hope you all enjoyed this lovely quilt, and that you have a better understanding of how improperly pieced borders (ie, not measured) can affect what your quilter can ultimately do to your quilt. This was a fun quilt to work on and I hope Robyn fully loves all of her great work! This started as a week of edge-to-edge quilts, but on Tuesday I was stymied when I discovered a client sent two large ones with insufficient backings. I quickly regrouped, and dug into the next quilt on the list - this light custom. The fabrics are reproduction prints and have a ton of texture. That outer border is Di Ford. Anybody who can make quilting show on these fabrics deserves my paycheck and admiration! I first looked at my stash of mustard colored threads to see what might work on the outer border, and perhaps the entire quilt. Here are the options...(L-R) Omni, SoFine, YLI Polished poly and Superior's newest 100wt thread MicroQuilter. I had yet to use the Micro Quilter, but did not want to quilt feathers on all those prints in a heavy thread. Micro Q won out! This post is partly to show what I did, but I think we as quilters can learn as much from the errors of others as we can the successes. This post is a little of both of those. Now this client is a nice lady, and she sends me lots of wonderfully pieced tops. I don't fault her for the suggestion. I bemoaned to her that I didn't know what I was going to do on the outer border - it is relatively wide. Apparently this quilt is quilted somewhere with feathers up the outer border through the columns, and a line pattern on either side, so she suggested this. Students that have had me in class have heard this before, so I don;t know why it didn't scream through my subconscious. I have this thing about putting showy motifs in places where they don't stand a snowball's chance of actually showing. But...yes, I went ahead and feathered on that crazy column fabric anyways. The choice of feathering there coupled with the lovely ultra-fine thread I chose was a double whammy of stupidity -- a mistake I won't likely make again soon. Now, don;t get me wrong, this looks fine, what you can see of it. It was like quilting with a blond hair with your eyes though. On the bright side, backtrack errors are more forgivable with super fine thread...which is good because I had no clue where I was backtracking! I didn't make that same mistake twice, and feather that inner reddish border though!...Learned my lesson the first time. This inner border got 1/2" lines. Use geometric textures in places with dense print. The center medallion is simple. It has a mottled dot print that would probably not show an interesting filler any better than it shows the stipple. I opted for the easier one! Gold star for me. Here's the outer border. The feathers and lines don't look bad, but they are definitely non-descript feathers, just a happy little bit of movement there. The back is that column fabric in a different colorway. In the right lighting, the quilting is pretty. Jean has more quilts in the mail heading my way...Cannot wait to see what fun she's sending this time! Tomorrow I return to a huge applique quilt that took a short side-trip back to California for some border repairs. It will likely be on the frame close to a week. No rest for the weary!! Sophie is becoming quite the quilting rock star at age 11. This is her quilt from the show. It won 1st place for the 4th consecutive year. It's a good fun little size to play with easier custom stitches. They always treat her with a custom lanyard, so it is fun to be there. I made a quickie trip back to Maine during the week to pick her up. She spent 2 days with me at the show, now being old enough to be trusted alone in the hotel for periods of time. She'd been home sick a couple of days, and mostly lounged between my longarm class and the room Friday afternoon. I don't think I'd want her there the entire time, but she managed to come and go without disturbance. She went with me to the banquet Friday night (which was the primary reason I wanted to get her Thursday). The speaker, Jean Wright, was a seamstress on the Shuttle program. She stitched all kinds of insulating blankets. It was the merging of my former (thermal engineer) and current careers, so it was massively interesting to hear her speak. I never teach Saturday, so Sophie and I can see the show. Anyhow, twenty of my quilts were part of the exhibits at the show. I have done in quilting in the last 8-1/2 years to be proud of. In the beginning I never imagined doing more than just quilting for clients. I managed to stumble into showing quilts only to discover I really love how that brings out the more creative and technical sides of me. To think then that I'd be making and showing competitively never really crossed my mind. I never imagined I'd write books, or that I'd teach at the very venues that I sought to take classes. Getting a solo exhibit is like the pinnacle of this business to me. Knowing that somebody appreciates my quilts enough to ask me to show them is HUGE. Truthfully, it just does not really get any bigger. I am humbled. Some of these most of you have probably never seen (and for good reason because they are really quite ugly!). The one on the right is one of the oldest ones I have made that lives with my mother. What was I thinking with that green log? Yes, there is a hammy model around every turn. It's obvious I have a thing for symmetrical, medallion style quilts. The silk was just beginning to make its way into my quilts when this was made...finished 2014. Here is the first time the "sister quilts" have been hung side by side. I think I want to do another Lucy Boston style of quilt sometime soon. This actually had good lighting where it was hung, but the color in the photo is off. It is purple, not mauve. And the other whole cloth...I need to design another one of these soon. The only non-medallion quilt... There actually is one more, but Sea Glass did not go to the exhibit. And the bed-quilt of my daughter. This was the first official quilt to go to any show. It's hand quilted. Somebody was nice enough to get a good picture of us in front of Big Bertha, which now resides on my bed. We stayed until the show closed and helped with the quilt take-down. It seemed like a better way to kill the 2 hours between when the show closes and when I can reclaim all my quilts. All that walking around and eating vendor treats is exhausting though! I am grateful for the many comments and questions. Many of you know that I happily share information when asked. I am still, however, getting comments from people that do not have a contact email properly set within blogger. What this means is that it appears that I just don't reply to your question. Please, please...fix this issue with your blogger account OR leave a contact email with your comment.